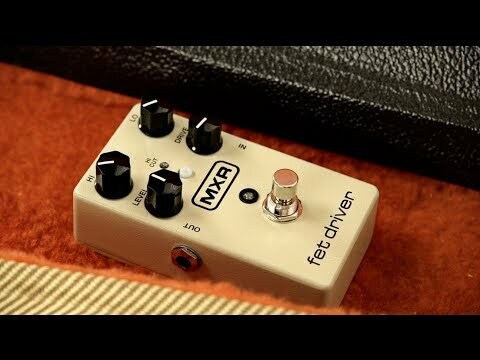 Featuring a unique circuit design, the MXR M264 FET Driver captures the rich, creamy sound of an overdriven tube amplifier by cascading an o.. Featuring a unique circuit design, the MXR M264 FET Driver captures the rich, creamy sound of an overdriven tube amplifier by cascading an op-amp gain stage into a FET stage. The FET Driver thickens up lead tones with musical, amp-like distortion and sustain without the fragility and inconsistency associated with tubes. Featuring a simple but responsive set of controls. Set your volume level with the Output control, and then use the Drive control to dial in the grit, from subtle soft-clipping to early stage distortion. Fine tune the FET Driver’s sound by tweaking Hi and Lo boost/cut controls, and push the Hi Cut switch to roll off high end frequencies when playing in high volume situations where excess noise is apparent.